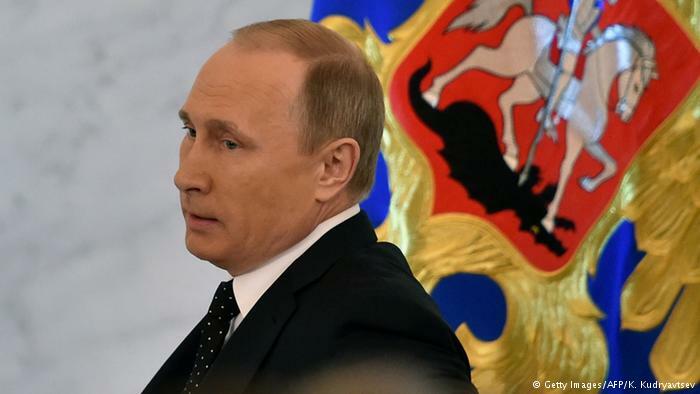 BERLIN, Germany -- Russia's power in the Syria conflict has been overestimated. The danger Moscow poses for Ukraine and Europe, however, has been underestimated. But the two issues are related, write's DW's Ingo Mannteufel. In 2015, it looked as if Russian President Vladimir Putin and his foreign affairs strategists had succeeded in using the proven maskirovka (masking) tactics of the Soviet army and Soviet intelligence to deceive the West and distract it from Russia's actual goals. Raising the stakes in Syria Russia's military intervention in the Syrian war has surprised - and even slightly frightened - the West. With it, Putin has managed to give the impression of political strength both on the domestic and the international front. But the actual secret behind this purported strength is the obvious weakness of the USA and the EU, who have shown only half-hearted interest in becoming involved over the four years of the Syrian war. Only the refugee crisis, the threat of "IS" terrorism and the appearance of Russian combat units have scared the West into stepping up action. Yet Russia's power in the Syrian war should not be overestimated. As a permanent member of the UN Security Council, Russia has certainly always possessed enough means to put stumbling blocks in the way of the West's foreign policy. The Kremlin has raised the stakes in Syria by building an air force base in Latakia and firing several cruise missiles from battleships. But no one should be deceived by these strong-arm tactics: even before that, Moscow helped out its protégé, Assad, with diplomacy and military aid. At any rate, Moscow will certainly not be able to create a new world order by its military involvement in Syria – the Middle East's competing regional powers and warring parties make the situation far too complex for that. The strategists in Moscow must know that, too. But the fact that Russia has infuriated the arch-enemy USA, and especially Saudi Arabia, by deploying its military to Syria is a welcome side-effect for them. After all, Saudi Arabia is the main country drastically forcing down oil prices, which are extremely important for Russia. But the increased Russian involvement in Syria can be understood only by viewing it through the prism of Ukraine. On the one hand, Vladimir Putin wants the sanctions imposed on Russia to be mitigated. On the other, he wants Ukraine to be destabilized to the point that its road to Europe is obstructed. That is the purpose served by the Moscow-dependent power structures in eastern Ukraine - the so-called Donetsk People's Republic (DNR) and Luhansk People's Republic (LNR). Their existence would be called into question if the Minsk II agreement were fully implemented and Kiev regained control over its own border with Russia. The fulfillment of Minsk II is, in turn, a requirement for the lifting of Western sanctions. However, it is not expected that the Minsk agreement will be put into action in 2016. Instead, Moscow is working to ensure that the situation in Donbass becomes what is known as a "frozen conflict." And Ukrainian politicians are playing into the hands of Moscow, as they are being hesitant about changing the constitution to grant more autonomy to the regions - especially in the disputed east - as prescribed by the Minsk II agreement. Russia's goals in 2016 Russian foreign policy in the new year will thus focus on blaming the Ukrainian leaders of state and government for the failure of Minsk II and, at the same time, presenting Russia as a halfway cooperative partner of the West in the Syria conflict. The Kremlin hopes that the EU states, whose cohesion has been hit hard by the Greek crisis, the refugee crisis, the terrorist threat and the growing strength of anti-European forces, will soften or even lift the sanctions imposed on Russia as a penalty for the Kremlin's policies. If this does end up happening, Putin's "Syria card" will have been played to maximum effect.